In an odd turn of events, Windows 8 has been banned from HWBot, one of the world’s top benchmarking and overclocking communities. All existing benchmarks recorded by Windows 8 have been disqualified. This is due to a fault in Windows 8′s real-time clock (RTC), which all benchmarking tools use as a baseline. Unfortunately, though, Windows 8′s RTC isn’t reliable. According to HWBot, Microsoft made some changes to Windows 8′s timekeeping routines to allow for low-cost devices and embedded systems that don’t always have a conventional PC-compatible RTC. HWBot doesn’t give specific details (presumably we’re talking really low-level kernel stuff here), but it proves its point with some damning empirical evidence. Basically, if you change your CPU base clock (BCLK) frequency in software (not at boot time), it has a massive impact on Windows 8′s ability to keep accurate time. 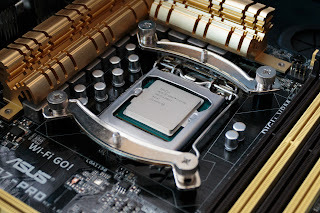 By underclocking the BLCK of a Haswell system from 130MHz to 122MHz (-6%), Windows 8 loses 18 seconds over a five minute period (see video above); and the inverse applies to overclocking, too. This is a problem for benchmarks, because they trust your RTC implicitly - they assume that your system is still keeping accurate time, when in actual fact it isn’t. So, if you run a five-minute benchmark on an underclocked system, the benchmark actually runs for five minutes and eighteen seconds (6% longer). If you boost your multiplier to compensate for the lower BCLK, this means that your computer draws 6% more frames or completes 6% more floating point calculations, resulting in a 6% higher benchmark score. If you underclocked your BCLK by 20%, you would see a 20% gain in the benchmarks, and so on. You can see how this would be a bit of an issue for a benchmarking site like HWBot. For Microsoft’s part, this issue can probably be fixed with a patch, though it might be difficult given Windows 8′s cross-platform nature. It will be interesting to see how quickly Microsoft responds, because benchmarking tools really have no recourse without an accurate RTC. Having an entire operating system outlawed from one of the world’s biggest benchmarking sites is a big deal. For now, PC enthusiasts have yet another reason to stick with Windows 7.